Examples of data from case studies and the range of analyses that are now available. To provide examples of the data collected from case studies across the South Island of NZ. To describe the range of analyses that can be used with the data collected by Manawhenua. How do I analyse the data and identify preferred flows? The data collected when the assessment team completes the assessment form in the field is the key component of the data set. Selected sites in a study catchment are typically assessed fortnightly over the period November – April and monthly from May to October. For the studies completed to date, over the course of a year, 15 - 18 assessments were completed for each site. Although the team of assessors do not know the magnitude of the flow they observe when they visit a site, by noting the time and date of the assessment it is possible to relate their assessments to the recorded flows for that day. 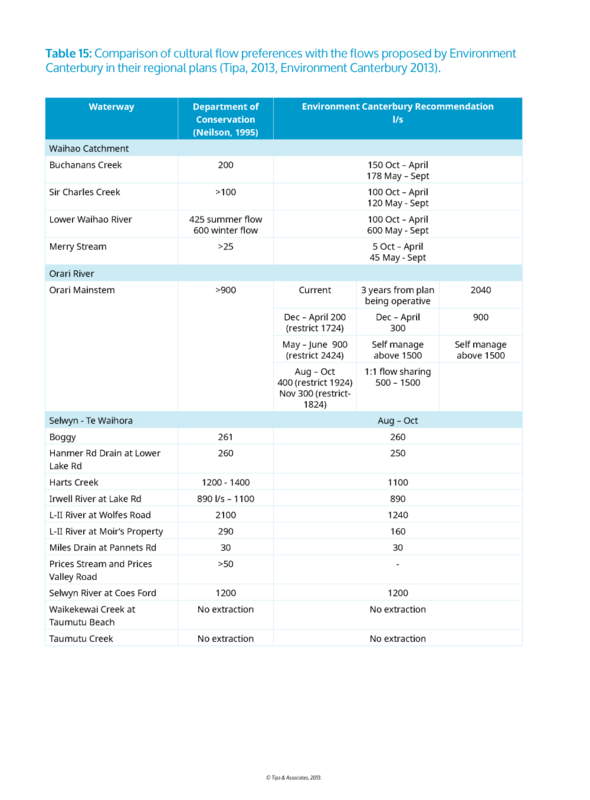 A record of the flows for specific dates can then be requested from the relevant regional council. 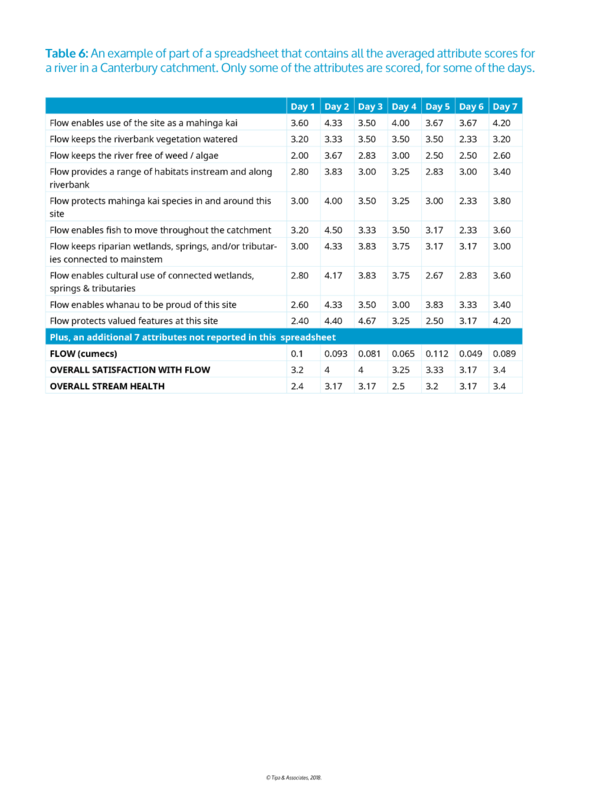 An example of a completed form (Figure 3) can be downloaded using the button below, while a summary of the data collected, and the analyses undertaken are summarised in Figure 4. ​A rating of 1–7 was given by each of the Manawhenua assessors for each flow attribute at each site visited (1 being totally unsatisfactory, 7 being totally satisfactory). The worksheet that is populated by the data collected in included as Appendix 2. Averaging the scores from all assessors produces a single score for each of the attributes. The average scores for each attribute were then recorded in a table along with the recorded flow for the time and date of the assessment. They were to rate their overall level of satisfaction with the flow they were observing. This was also rated on a 1-7 scale. As a final question, they were asked to rate the overall health of the site. This score is important as we need to be assured that flow is the factor determining the scores and not more general concerns about the health of the site. An example of a spreadsheet for one site, showing the collated average scores, is presented in Table 6. This data is from an assessment of a small stream in a Canterbury catchment. Please note this table is for illustrative purposes only and contains eight days of data (not the full dataset of 17 days). Similarly, only 10 attributes (a subset) is provided and not the full list of attributes. At the completion of the fieldwork, we have a workbook that comprises a spreadsheet for each of the sites assessed for each day the team was in the field. It is the data in this comprehensive workbook that we then subject to several analyses. ​The purpose of the analyses is to provide a level of confidence around a flow threshold above which Manawhenua are likely to be satisfied with the flow. Conversely, we also want to understand the threshold below which are the flows that whanau will not be satisfied with. The recording forms have between 14 and 19 individual attributes. Each of these can be analysed. With this type of analysis, we can refer to the values associated with a site and the opportunities that whanau want to see delivered in the future. ​If the site is valued as a mahinga kai, the scores need to show a level of satisfaction across the mahinga kai attributes – at the very least. We also use the scores to focus on the individual attributes to identify the lowest flow above which that attribute receives a satisfactory score (as shown in Table 7). The design of this table is based on the structure of habitat retention tables. Again, we recommend that this information be considered alongside the values and opportunities mapping. 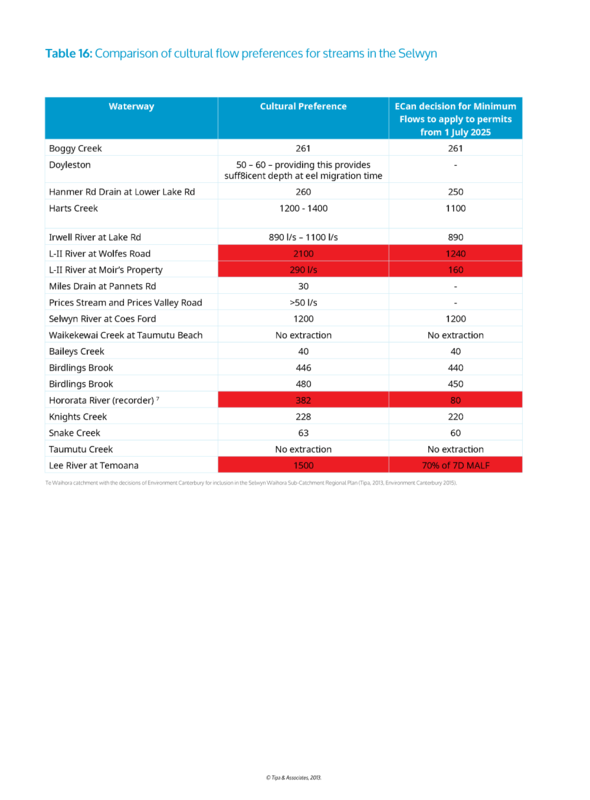 If a key value is the supply of water from riparian wetlands or springs (which could represent vital cool water inputs at certain times of the year), then Table 9 suggests that Manawhenua could be advocating for flows around 42l/s. It is also possible to undertake sensitivity analysis. For example, whanau, hapu or iwi may decide that instead of analysing scores above, because of the range of values in a catchment, they will consider scores above say 3.25. Conversely, if a stream is classed as wai tapu, which is to be accorded protection pursuant to the provisions of the National Policy Statement: Freshwater, they may seek to maximise satisfaction scores. We can identify the days of observation where and when the highest and lowest scores were recorded for each attribute and importantly identify the corresponding flow. Generally, however, this information is of value to Maori, the intent of the analysis is not to identify the flows that will maximize their level of satisfaction. The study highlights the range of flows Maori will be satisfied with. Philosophically, this means that the flows may be lower than the flows that Maori aspire to see in the river. Drawing this distinction to the attention of Maori is another important aspect of this type of preference study. It is also important to convey to others with an interest in water, that the recommendations from whanau already represent a balanced appraisal and in effect a trade-off between the maximum and the satisfactory value. 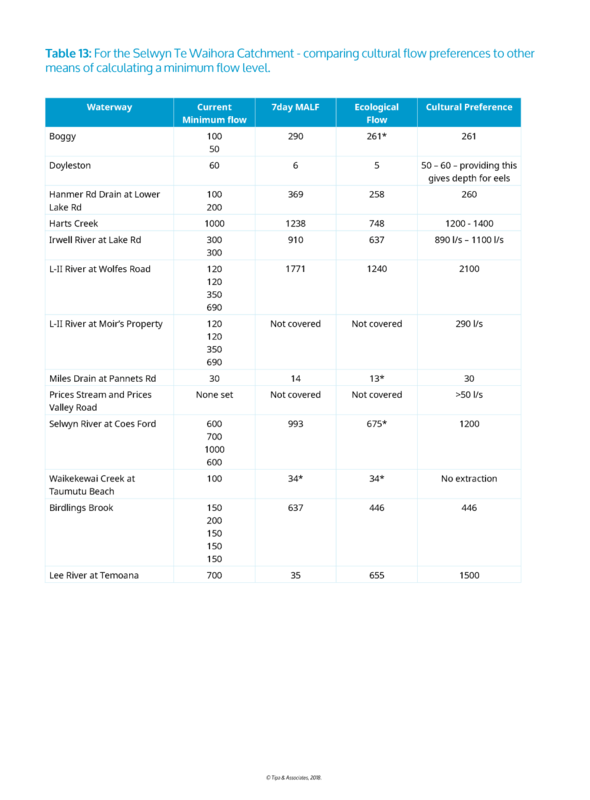 Please note that Tables 6 and 9 contain the same data, which relates to a stream in a Canterbury catchment. The only difference is that one table (Table 9) is colour-coded. Tables 6 and 9 show that flows as low as 49 l/s (0.049 cumecs) are considered sufficient to sustain use of the site as a mahinga kai if whanau set a satisfaction level of 3.5. However, when the flow is 49 l/s not all the attributes within the mahinga kai component receive a satisfactory score. For example, there are concerns about the species themselves and their ability to move within the system, and the presence of weed and algae. These issues require further investigation with help of bio-physical scientists. For this stream, when all attributes were assessed a flow of 890l/s was preferred by whanau, which was the flow set by the regional council. As noted earlier with respect to Table 3, the attributes can be grouped under a series of components (or themes). 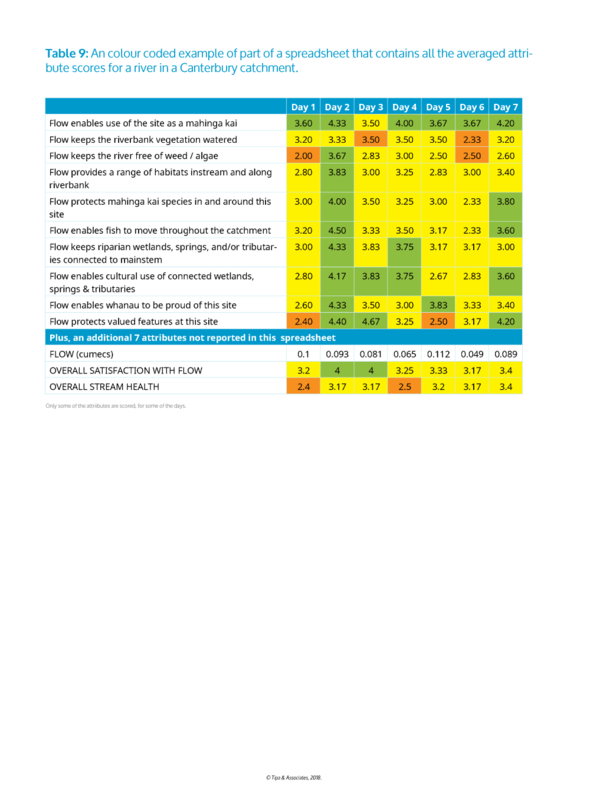 With the second set of analyses, we aggregate the scores for the different components and colour-code them. The data in Tables 10 and 11, specifically the four theme ratings, shows that a flow of 2000 l/s was totally satisfactory. 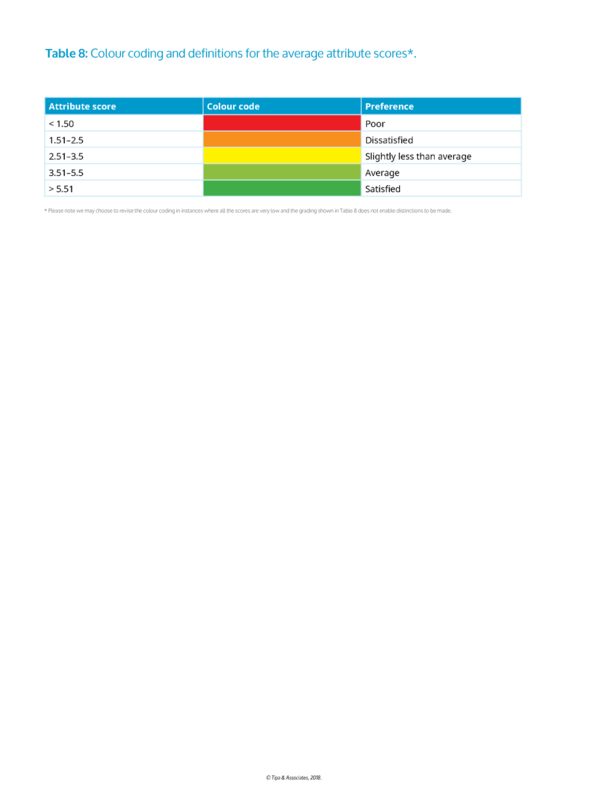 In contrast, the scores confirm that a flow of 340 l/s is perceived as unsatisfactory (scoring less than 3.5 on a 1–7 scale) by assessors across all four themes. In fact, flows at or below 350 l/s were consistently scored as being unsatisfactory across all four themes. However, whanau also rated flows between 350–650 l/s as unsatisfactory and of concern for at least one of the themes (usually the attributes associated with Wai Maori). These initial analyses, that consider the ratings for satisfaction with the observed flow, suggest that the current minimum flow of 250 l/s could be considered too low by Te Runanga o Moeraki. This analysis could be interpreted as "more water is better" from a cultural perspective. However, high flows that are seen by whanau as cleansing the river, may also make the river unsafe for some cultural uses. 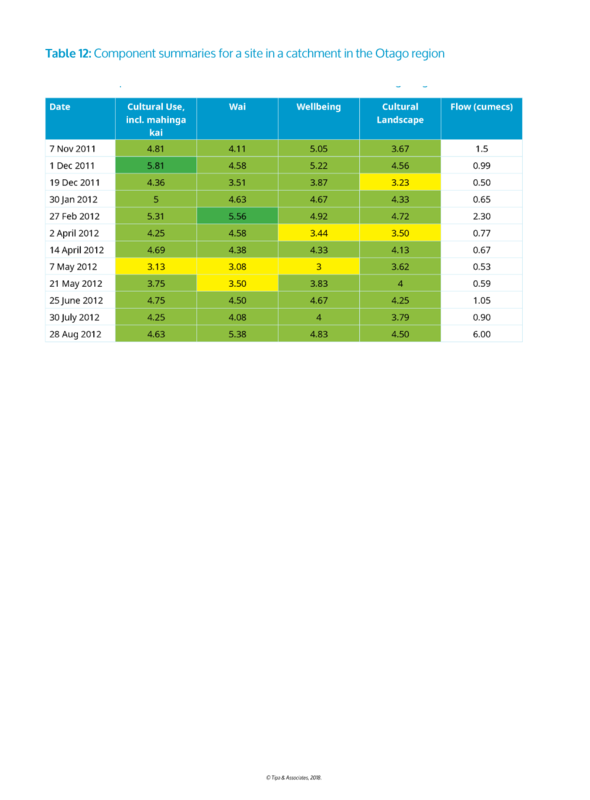 The ratings therefore need to be analysed alongside the results of the mapping exercise (described for Step 3). 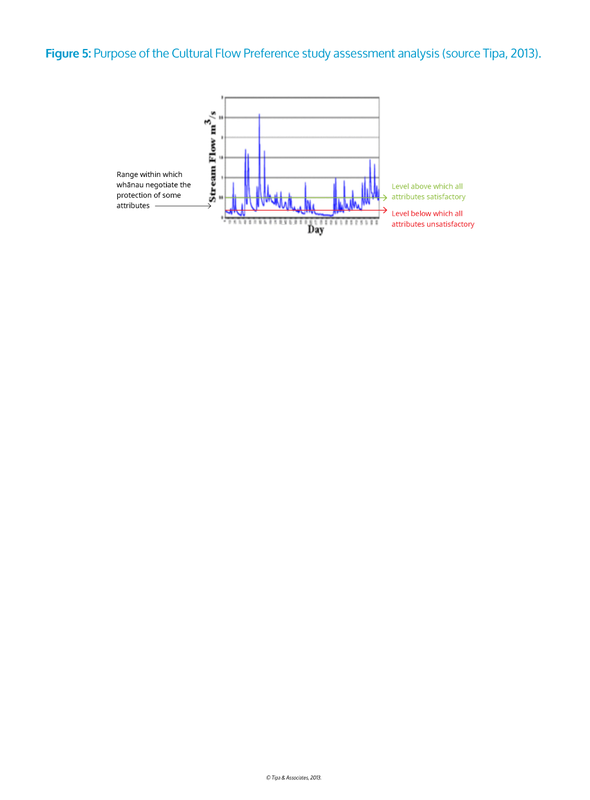 Manawhenua had identified the periods of the year when low flows are expected. Conversely by mapping the spatial extent of higher flows and when they are expected insights were gained to the expected seasonal flow variability. This analysis represents another opportunity for Manawhenua to link with others undertaking EFAs so that the seasonality of low flows, higher flows, and the links between biophysical processes and cultural values can be explicitly examined. Table 12 enables us to examine the scores for a specific date, we are also able to collate all the component scores and colour code them. We can use Table 12 to identify the flows that resulted in the highest grading for each of the components. From Table 12 the date of the highest scoring components, along with the corresponding flow, can be identified. When we examine the attributes aggregated into the three components for this Otago site, the scores when flows are below 600 l/s result in at least one of the components receiving a score slightly below average. When identifying their aspirations (opportunities sought in the future), whanau who are the kaitiaki for this catchment stressed the importance of mahinga kai. Flows below 600 l/s are not likely to be acceptable as the mahinga kai values are likely to be highest at flows around one cumec. Although the team of assessors are mandated to participate, before stating their preferred flows, whanau are usually required to report the results of the analyses back to their hapu or iwi. Photos are particularly useful in enabling whanau to compare flows on different days and how the river changes under different flows. For example, photos 21 and 22 show the differences observed in a Canterbury Stream at 300 l/s which is the current minimum and 890 l/s which is the flow preference of whanau (Tipa, 2013). During the fieldwork a team member was assigned responsibility for taking photographs at each photo point. Photo points also enables Manawhenua to identify specific issues. For example, the photos on the next page show a site that was assessed that was modified to enable the passage of floods. From the perspective of whanau, river engineering is a risk to the protection of the values held by Manawhenua. 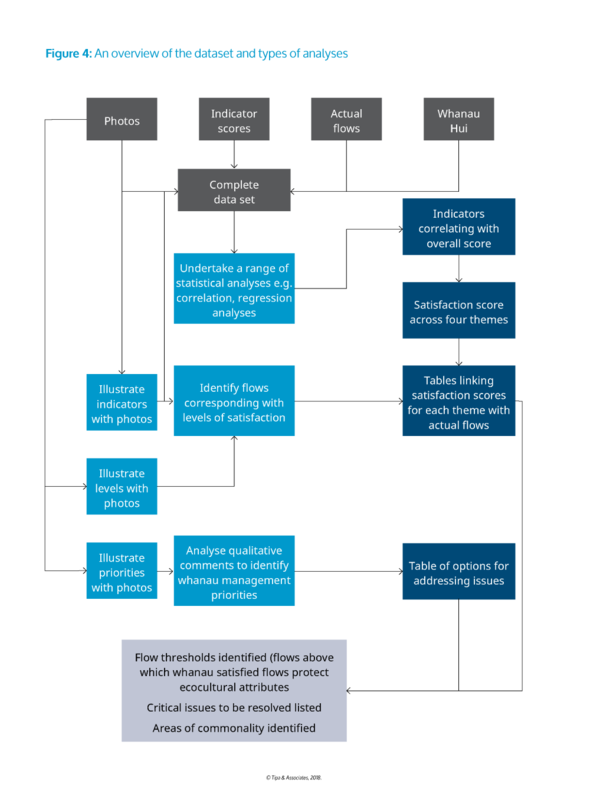 To complement the flow data collected, cultural health (which focuses on the overall health of the site and not just flow) is assessed on the first visit using the Cultural Health Index (Tipa and Teirney, 2003, 2006). It is acknowledged that whanau, hapu and iwi will have their own tools that they may also wish to apply given they have a mandated team in the field. The same river in Canterbury after river engineers had undertaken in-stream works. Although this Website is principally intended to describe a CFPS, it is important to ensure that whanau, hapu and iwi understand how the flow preferences of Manawhenua relate to the aspirations of other parties and other commonly used hydrological parameters. 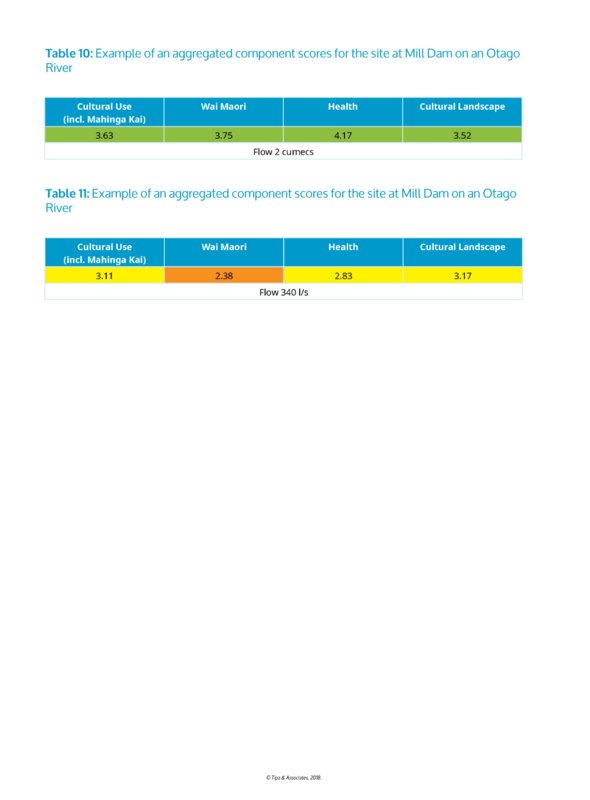 In Table 13 we compare the cultural flow preferences from the Selwyn - Te Waihora study (see Tipa 2103) with other hydrological parameters, such as the current minimum levels that Environment Canterbury operate to, the 7-day Mean Annual Low Flow (7dMALF), and the recommended ecological flow based on the methods set out in the National Standard for Ecological Flows (Beca, 2008). 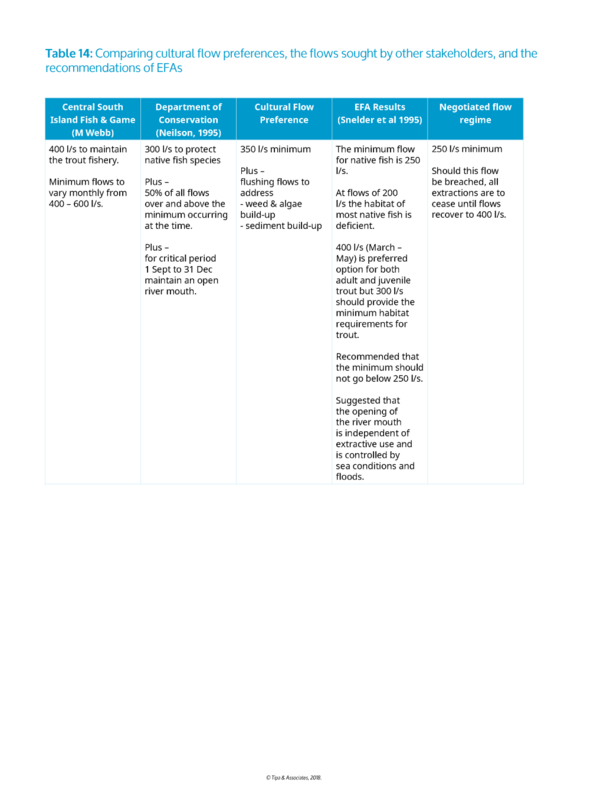 The cultural preference for the minimum flow, can be compared to the minimum sought by other stakeholders and the recommendations of EFAs, as shown in Table 14. Because of the need to correlate cultural ratings to the averaged flows on the time and date of assessment, representatives of Te Runanga o Moeraki have been trained in how to use flow recording equipment so that readings can be taken at the time of their cultural assessment. This training is essential as many of the rivers that Maori want to set environmental flows, the regional council or water users do not collect flow data. The CFPS represents a participatory process that has been formulated is intended to inform environment flow setting processes. A CFPS is intended to address a shortcoming identified by Connell et al. (2005) that little guidance is available to help water managers work with Manawhenua. The analyses are intended to progress beyond descriptions of how indigenous communities attribute meaning to water (Langton 2002; Toussaint et al. 2005) to an understanding of how river flows impact these meanings and associations. Ultimately it is for regional councils to determine the flow regimes that are to be applied usually via regional plans formulated pursuant to the provisions of the Resource Management Act 1991. 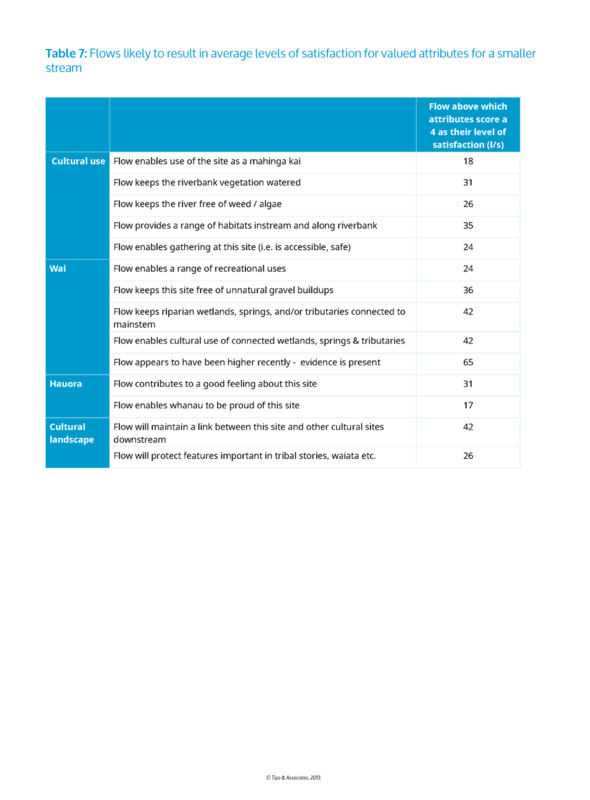 Table 15 compares cultural flow preferences identified for three catchments (Waihao, Orari and Selwyn/Te Waihora) with the flows proposed by a regional council in their regional plans. The intent however is not to enable Maori to strengthen their submissions to statutory plans. The intent is for cultural flow preferences to be reflected in the regulatory provisions of the proposed plans that are notified, and the decisions of regulators. Our final table therefore compares the cultural flow preferences with the flows recommended by the hearings panel (and Council). Some may argue that the CFPS only enables identification of a minimum flow. This is incorrect as Maori identify a range within which they know that all their attributes (and components) are likely to achieve satisfactory scores. Having established low flow thresholds, the expectation of Maori is that the agreed flow regime will include seasonal variability. In all studies to date Maori have emphasised the importance of a flow regime that incorporates higher flows sufficient to trigger and enable fish migrations at key times of the year. Ecologists and hydrologists can assist with determining the size of flushing flows.